SN Bearing inserts are designed for quick and easy changes for failed line shaft bearings. 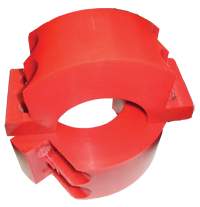 The bearings are split for fast installation to save on costly down time expenditures. Redco™ Plastics can outlast traditional materials such as rubber, wood and some metals by up to 20 times. Call us today about your application, we can help save you part replacement costs and downtime expenses.